For the unititiated, "WaNeLo" is an internet social networking site centered on shopping mavens. The acronym stands for "Want, Need, Love". It's a place where one can look at other shoppers' finds and add finds of one's own. Horses need not apply. The inspiration for this week's blog is an article in the September 2013 issue of Equus. Unfortunately, the link won't be available for a month (Equus is like that), so you'll have to trust me to summarize accurately. The title, "What Do Horses Want?" was an absolute must read for me. If there's anything more important to my horse life than keeping my horses happy, it's keeping my SO, Cliff, equally happy so he'll keep the equipment happy, and we'll all live in harmony. No one has yet done a study on non-horsey Significant Others, so I may have to launch my own, but for now, the horses are in the spotlight. Pokey always voted for a personal masseuse. Here she's being attended by Laurie Swartz, Equissage Person. The article summarizes the results of some rather well-designed behavioral studies done on horses recently at Cornell University. They do that stuff there, you know, along with pumping out an inordinate number of Nobel Prize winners and the like. Their results are generally trustworthy. The magazine cover blurb for the article is a titillating "The answers may surprise you." They did. Not all of them, of course. It came as no surprise that given his druthers, a horse will not run. I was once asked by a WSJ reporter to explain whether or not jockeyless racing was an option. My response, given my vast years of race experience (*ahem! * ...none) and decades of being around horses (too many) was no. Categorically, horses will not run without some really intense incentive. I know that. Most horse owners and barn owners know that. Until now, however, there hasn't been empirical proof. Now there is. The horse would prefer not to even trot, and left on his own, he will spend less than 1 percent of his time moving faster than a walk. That's not much, even in horse hours. But some of the other findings were more intriguing. Of course it's a given that horses want soft bedding to lie in. What they want is a lot of soft bedding, and they prefer straw overall. They will stand pretty much anywhere, but they like a fluffy bed for lying down. They love company, preferably other horses. Not that a goat or what have you won't suffice in a pinch, but they don't like being alone and prefer to be with equine companions. You are not an equine companion no matter how often you trot around the pasture trying to get a halter on your horse. They like the lights off. Given a choice (the test subjects had a switch they were trained to use to turn the lights on and off), they opted for dark for all but a couple of hours a day even when confined to their stalls for two weeks. But, given their distaste for human comforts like artificial lighting, it was surprising that they opted to turn on the heat lamps for hours daily. They like to be in their stalls. Now this one is about as counterintuitive as it gets. But trained to use a Y-shaped passage that let to the pasture on one side and back to their stalls on the other, the vast majority of the time, they opted for their stalls. Likewise, given the option of unlatching their doors (pre-trained to touch a metal plate x number of times to release the latch) or staying locked in, they showed the most interest in exiting if there was a food reward outside. Second-best was a horse companion. Solitary turnout....not so much. The Big Question of neck flexion brought a not-unexpected answer. They like to flex their necks as much as they choose. And they don't choose Rollkur or anything close to it. Only one test horse voluntarily flexed to a major degree. I'm sure the research will be ongoing as there are still more questions than answers about horses. What bands to they prefer for their listening pleasure? Carrots or apples? English or Western? Female rider or male? The list is endless. Of course you can devise your own test. The basic problem is to eliminate human influence (you can't be holding your horse's lead rope or poking him with a stick to get the result you want), and also to make the test situation horse-friendly. We tend to anthropomorphize to such a great degree that we're not doing very well at setting up reliable, replicable test situations. Horses don't do essay questions well, and they're not going to be happy with a oral exam. It has to be non-verbal, and there have to be only the options that would exist in the horse's real world. He has to be free to choose, and the choice has to make sense on a horse level. So get out there and bed those stalls, turn off those lights, and let resting horses lie. Could be the start of a whole new relationship. It's not too late to learn; it just takes a different approach. This article, published on New Year's Day of this year (2013) focuses on learning the guitar. You're probably not learning the guitar. 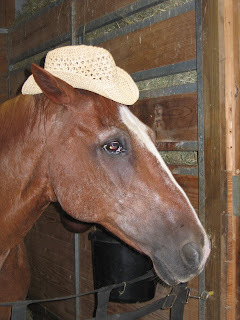 You're probably here on this blog because you have something to do with horses and want to know if all hope is lost because you're over 7 years old. If you have amblyopia ("lazy eye"), you're in luck, because the article also focuses (pun intended) a bit on that. 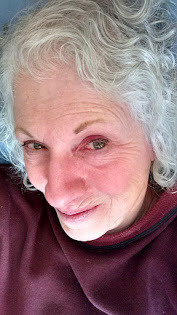 The answer to all questions regarding aging and learning is NO and YES! You truly are not too old to learn a lot of things. Note I didn't leave that open-ended. There are some things you probably are too old to learn, depending on the condition of your body and your brain and just how interested you really are in taking on new skills. I know as I've aged, my desire to learn new things is often more verbal than mental. That is, I talk a good show, but I don't think much about it after I've told my story to whoever will listen. Witness my resounding failure to self-teach Cantonese using a set of DVD's and a text I got from Amazon last year. I learned a few phrases, which made for a great party trick, and I made a valiant, if cursory, attempt to video chat with a friend in Taiwan, but I never got past Chapter 1 in the book. Ni hao a! Me, learning why mirror-selfies are a bad idea. If what you want to learn is horse-related, is it strictly mental (that is, do you want to simply know more about horsey stuff) or is it physical (do you want to learn to vault onto your horse from behind and gallop screaming into the sunset)? I, for one, have fantasies of doing all sorts of physical things that my body simply is never, ever, ever going to do ever again (if it ever could). I'm old. I have arthritis in places where I didn't know it was possible, and I have developed a fear of hospitalization. I've had friends who simply went in and disappeared, and I'm not sure that's entirely my paranoia dark-tinting my rose-colored glasses. So my prospects are limited in a very real way. I ride. I ride as many days a week as the weather and my plans allow, which is most days. I do a little dressage (my memory isn't what it was, so I have to keep checking the test charts at night so I won't forget the test while I'm riding it), a few cross-rails (up to a pacemaker-stopping 18-inches) and run barrels and poles, which I've done so often there's little chance of error or serious bodily harm. If I take a lesson, I need weeks to practice all the things I was taught, so another lesson in a week is pointless for me and frustrating for an instructor. I'm not sheepish about admitting I didn't learn whatever it was. I am thrilled, by the way, for all the old people who are doing phenomenal things. A woman in her 80's doing yoga moves I couldn't do in my 20's is nothing short of amazing. She's also one of a kind. Though it's often inspirational to see other's succeeding in Herculean efforts, it can be disconcerting to those of us who simply can't. We would like to. We just have things about us that prevent certain accomplishments. We need to not feel bad about ourselves. We need to work within and perhaps a bit past our limits without feeling like failures if we don't wind up front-Facebook-Page-center. But learning is important, and so I continue to read, take lessons, attend clinics, and add small nuances to my exercises. I've gotten better in some surprising ways as a result. My overall balance and ability to stick to the saddle are possibly the best they've been. I can "hear" what the horse needs better than I could when I was younger. I'm not as likely to ignore what I "hear" in favor of what someone says I "should" be doing. I know lots of intriguing things to do with horses that didn't occur to me 20 years ago. I'm less focused on how I look riding than on how I feel the horse connection. It's all good. Learning new things has an overlapping, synergistic effect. Learning music makes you better at math and gives your riding a leg up on the cadence concept. Learning yoga makes your balance better and helps you focus in other activities, like staying centered in the saddle. Learning to play tennis improves your reflexes and makes you more responsive and quicker in the saddle. Learning anything changes your brain, so continued attempts are never wasted. This article (http://lifehacker.com/the-science-behind-how-we-learn-new-skills-908488422) is LifeHacker's expansion on the one linked above, and it's got super-cool illustrations, which are perfect for those of us whose attention span is fleeting but who are able to focus at least momentarily on nifty drawings of brains and other stuff. If you are too over-stretched from all this thinking to read, at least look at the illustrations so some of this new learning will stick and change your brain into something more impressive. Study On! You have nothing to lose but a little time and the misconception that you're truly an old dog. This article is one of the best I've read this week. I'm not someone who has trouble making decisions. In fact, I have trouble focusing long enough to think that my decision might not be the best one. So this even makes sense to me. Perhaps the most difficult part of horsemanship is that decisions are unilateral while the effects are multilateral. The horse really doesn't have a whole lot of input into what we choose on his behalf, does he? We pretty much call the shots. 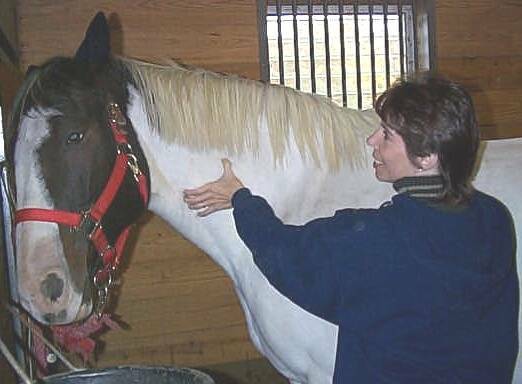 And how our decisions impact the horse is how the horse's reaction also impacts his herd mates and the other humans who have to interact with him. 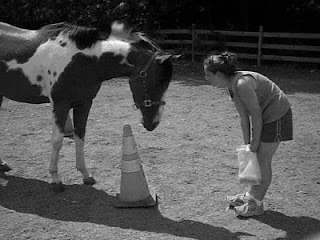 Example: Years ago someone I know read about teaching a horse tricks. She followed the instructions to the letter, and in no time she had her horse lying down on command. The training regimen began with picking up the horse's front leg. Then it proceeded through rocking the horse back with that leg lifted until gravity explained to the horse that lying down would prevent falling down. Before long, just lifting that front leg was sufficient to cue a lie-down. Awesome! Cute! Stunning! It was all wonderful until the next farrier visit. The shoer picked up that leg, and...yep. On the farrier. So the decision to trick train was an easy one to make. It's a neat thing to to. It builds a bond of trust between horse and trainer like no other. It's fun. And it's a great way to impress friends and family and kill time until the baby is old enough to start under saddle. But it's not a decision to be made lightly. Foreseeing unforeseen consequences of our behavior is an art form few have mastered. Thorn Koslowski, author of the article above, has laid out four simple ways to make sure you're making the best decision. For me, unleashing my inner Contrarian is probably the most useful. I'm never at a loss for a quick decision, but I rarely bother to look at the down side before it smacks me in the face. When Zips Buzzcut was just a little sprout, I taught him some nifty behaviors surrounding orange traffic cones. I was learning about clicker training, and the book suggested not using anything as a target that is commonly in use around the horse for other reasons, so I bought a pack of tiny orange cones at Le Mart de Wal and went about getting Zip to do things using those as cues. His fave was fetching. I taught him to fetch so that he would pick up my dropped crop or whatever for me. Score one for the lazy side! I taught him to stretch both front feet singly and together because getting under his massive chest to do that to keep skin from getting pinched in his girth was far too dicey. He loves to lick and chew on my hair, belt, bottom, arm...anything he could reach. He's a very affectionate horse if a tad short on personal space limits. It's all been functional and fun, and I really tried to think through the down sides of these endeavors. But, alas! I missed a few fine points. For instance, the cue to "back up" is too similar to the "stretch" cue. So if I'm standing right in front of him and give him the cue, I'm as likely to get my feet stomped as I am to see him move back away from whatever I need him to move away from, like my body. Likewise, the fetch-the-cone intro lesson was fine, but it got annoying when he started fetching and rearranging the full-sized traffic cones I used as markers in the riding ring. Deciding to make him a dressage horse when he was happy being a jumper was also not well-considered. Some horses can handle being both scopy and highly collected without their brain hairs frizzing. Zip, not so much. The more I tried to collect him, the more tense and unhappy he became until he wouldn't move forward at all. That made life fun for everyone who had to deal with him. Trickle-down at its finest! I'd had the same response from my first Quarter Horse mare, and I should have recognized where we were heading, but I didn't. I'd like to add a fifth suggestion: Decide in advance what "success" will look like. It'll help you pick a clear path. Perhaps the worst decisions I've made personally were bad simply because I didn't have a clear end point in mind. So read the article; think about the ramifications, and maybe your future decisions won't be as tedious or stressful or chaotic as they might otherwise. Or don't read it. It's your decision. Can you figure out what the photo above is about? Look at it for as long as it takes, and eventually you’ll come to a conclusion of some sort. You may be wrong, but you’ll be satisfied for the time being. Your mind seeks closure—an end, a definition, a solution—and will create it if none is obvious. It’s the inability to reach closure that can lead, in some people, to feelings of guilt that can become so overwhelming that anxiety and depression aren’t far behind. According to the study cited in the article above, this isn’t a universal problem. “Type A” personalities, it seems, are less likely to finish a book or some other project and also less likely to feel guilty about it. They get their kicks just starting things and getting whatever they can from the effort as quickly as possible. I can attest to that, as I am a prime example. My stack of unread books stares mutely at me without evoking any inkling of guilt or remorse. I feel annoyance that I have to keep moving the stack to clean around it, but no remorse. Type B’s, according to the report, are less likely to even start a project they know they can't (or won't) finish. They feel guilty if they stop mid-stream, so they try not to be in that position. I’ve got a little of that in my psyche too, but not nearly as much. I’m a born quitter. Okay, that’s not true. It’s not that Type A’s quit so much as that they think they see the endpoint somewhere around the middle, and don’t bother wasting time getting there via the circuitous route that includes actual completion. The study doesn’t specify, but I’m going to posit without any research to support my supposition that people who tend to do that also tend to be quicker to make decisions and lean heavily on instinct. We’re the folks Click! describes so well. We don’t need to see all the pieces to believe we’ve solved the puzzle. Does that translate into bad business with our horses? It certainly can. 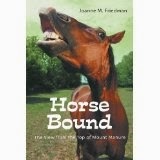 If there’s anything in the world that cries out for an organized, step-by-step-to-mastery approach, it’s horse training. While I’m jumping to conclusions and pretending that we’re already at X, Zip is hovering somewhere around C wondering where in the hell I went and why he isn’t there with me. Above is the same scene as the first photo, but on the second try I was more careful not to let the camera self-focus on the window screen. See how different it looks? See how you can tell what's in the picture? See how your horse is standing behind you nodding in agreement? Once again, we're zooming in...out...in...out, but we're also avoiding jumping to closure. Are you tired yet? This horse life is no place for pussies! I intend to aim for more B and less A in my approach to life in the future. Not starting something I can't finish is anathema to me, so it's not going to be an easy swap. I've already made some changes in the right direction in checking in with my horse before I decide to launch a workout. Next step is to try better to analyze which parts of the workout are valuable, which I can actually accomplish, and which are going to die on the vine because I'll jump to the end of the book while I'm only halfway through the table of contents. I'm sure you're doubting that you have habits that are so worthy that you want them stronger than they already are. You do. Everyone does. We all have good habits that help us get through our days with flair and enthusiasm along with the bad ones we'd so dearly love to ditch. The key is to make the good habits stickier than (or at least as sticky as) the bad ones. Regular readers of this blog have probably already finished the assignment from several weeks ago that involved buying, borrowing, or otherwise getting access to a book entitled Made To Stick, by Chip and Dan Heath. The Heaths have analyzed what makes some ideas stay around while others languish and disappear. It's worth checking out if only to prove to yourself that still have space in your brain for something new and different and without a direct connection to horses and/or Facebook. The Heaths' premise is directly related to that of today's article. If you can find some way to hook a new idea onto the coattails of an old one (even if the old one was bad from the get-go), it will endure with less effort than a free-floating, disconnected thought requires. Consider how hard it is to learn a foreign language that includes a non-Western alphabet. I rest my case. I spent a great deal of time attempting unsuccessfully to teach myself Mandarin. I am convinced there is nothing residing in my brain that wants to hook up with those beautiful little pictographs. Anchoring new habits to old ones uses the same mental processes as anchoring new thoughts to old ones. A few weeks back I gave you the name of the part of your brain that makes its living looking for novelty and sameness. It's that brain piece that you are going to activate. Let's assume that you have already identified a habit you would dearly love to make your own and which is defying your attempts to stick it firmly into your constellation of behaviors. Perhaps it's something so different from what you normally do that you find yourself relapsing to the prior bad habit. Maybe it's just close enough to your existing pattern that you can't quite seem to separate it and give it life. Or it could be that you have an overweening bad habit that is blocking your attempts. setting up a cookie buffet in the barn aisle. I, for instance, have developed over years of careful fostering the habit of nit-picking. This is not a good habit most of the time. It serves a purpose in that it keeps me on top of a lot of things simultaneously (or so I'd like to believe), but in truth it belies a level of distractability that probably isn't healthy. Yesterday I had just finished tacking up the Zipster for a ride when he pooped. Yep. He did it right there in the cross-ties. Happens every time, almost as if he plans it that way. We were all ready to go, and since he was being very cooperative almost to the point of seeming anxious to get to work, I should have just left the pile and come back to it later. But I didn't. I did what I always do; I tied him again and went for the muck fork and bucket. And the broom. And the dust pan. And a cookie reward for his patiently lapsing into a near coma while I fussed around. I would like to replace that silliness with the habit of following through on my plan without interruption. I need to find a good habit to which the new one can be linked strongly enough to override the current arrangement. I'm very good about approaching the grooming and tacking-up piece very methodically so that nothing is forgotten or left unchecked. It should be possible to connect the new habit of simply moving forward with my planned activity to that system. Making it part of the plan is undoubtedly the best option. It's easy, at this point, to see how this also applies to horse training. Find a good habit similar enough to the new process you're trying to implant and link them together. If Happy Feet is excellent about standing for grooming, tacking, clipping and so on, connecting standing at the mounting block should be simple enough. It can be done by adding a small behavior to the end of the first habitual behavior (say, shift left, shift right, step back, stand) which can also be added to the new behavior to make them seem connected. If consistency is part of the equation, it shouldn't be long before fidgeting, spinning, side-stepping and other antics are supplanted by just standing. Joy! So read the article (and the book, if you skipped that assignment), and see what you can fix with just a few changes to your perspective on the whole learning thing.